This is an individual map release but it also comes with an episode mod that features all three Turok Nukem maps in an episode as one. I was hoping that the map could be featured alone to line up with the other two. I don’t know sorry for the confusion. Though I have took 3 years to produce this Turok 3 map 90% of the map was made about a year or 2 years ago. I recently picked it back up finished the gameplay and put it together. So this map was actually pretty much done before I released ‘Haunted Nukem’. I have done a lot more mapping since this but this map was a huge part in my growth as a mapper for any game. All important info about the maps creation can be found in the text files there is one specific for each map also. Thanks hope you enjoy feels good to let this one fly out the nest. I had no idea it would be a continuous spree of the same style of the jungle maps this was unplanned how it turned into an episode. The first map was not made based off of any specific area in Turok. 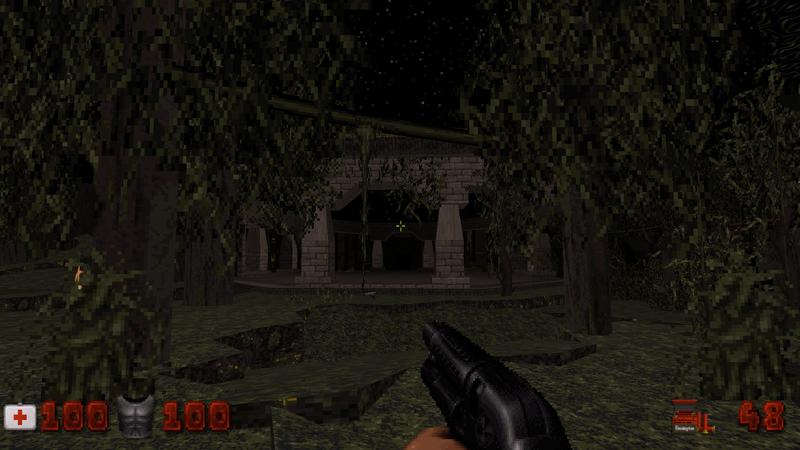 It was simply a map made to feel like it was a Turok setting, a Turok tribute using Duke textures. The mod also includes 3 death match maps made from each level and cut short to form a dm experience. The first map was made a few years ago and you’re bound to see mapper growth through the maps. I made the Turok2.map instantly after the first and it released a month after. I started Turok 3 instantly but still have yet to release it. Until now. The third map hits one of the map size limits I thought of splitting the map into two. But I thought that the map held me together, so I’m not gonig to separate it. The vanilla version will not feature any new weapons,sprites, or textures from Turok. This only features Duke assets I challenged myself to use them to make jungles/temple areas. There is a separate version still in the works that does feature Turok assets.